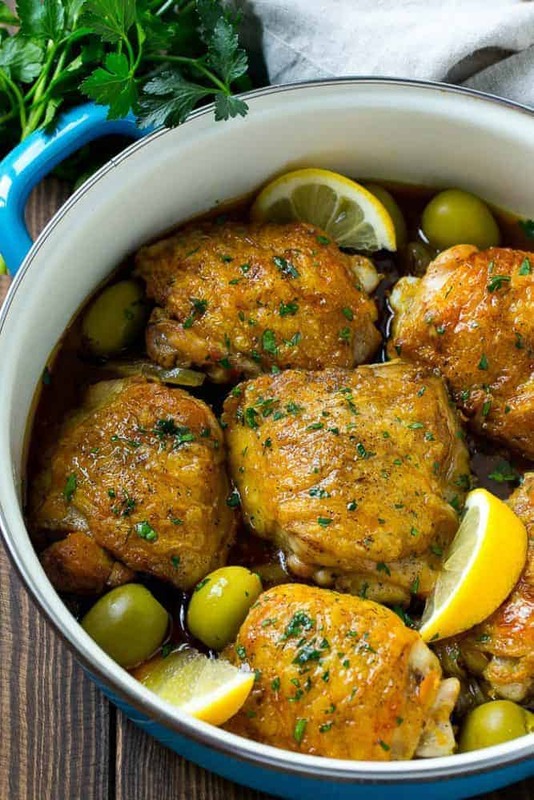 This Moroccan chicken is tender chicken thighs cooked in an aromatic sauce with olives and lemon. An easy dinner that’s full of unique flavors! We eat a lot of chicken in my house – it’s inexpensive, convenient and my kids love it! This Moroccan chicken is a little different from your typical chicken dinner, but it’s packed with the most amazing flavors and it’s super easy to make too! 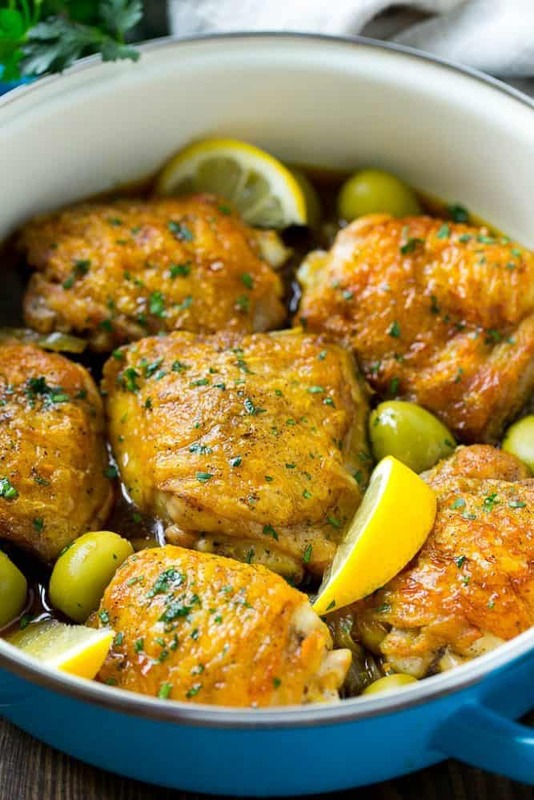 To make Moroccan chicken, you’ll need chicken thighs, onion, green olives, lemon and spices. The chicken thighs are seared to golden brown perfection, then combined with sauteed onions and spices and roasted until done. Be sure to use an oven safe pan so that you can transfer it from the stove to the oven without any issues. I always use bone-in skin-on chicken thighs for this dish because I think they have the most flavor and they don’t dry out in the oven the way that leaner cuts like chicken breast can. If you’re not a dark meat fan, try bone-in skin-on chicken breasts instead, but be aware that the cook time will need to be adjusted up to compensate for the breasts being larger and thicker than the thighs. The spices that give this dish its Moroccan flavor are ginger, cumin, cinnamon, turmeric and paprika. The cinnamon may seem like an odd addition to a savory chicken dish, but it really works so well with the chicken! The olives and lemon juice are added at the very end, along with a sprinkling of parsley. Then you’re ready to eat! This chicken is great served over couscous or rice. I also often serve a green vegetable on the side like asparagus or broccoli. I love this Moroccan chicken because it’s easy enough for a busy weeknight, yet fancy enough to serve to company. It doesn’t require any specialty ingredients, yet it tastes like you’re eating at a restaurant! 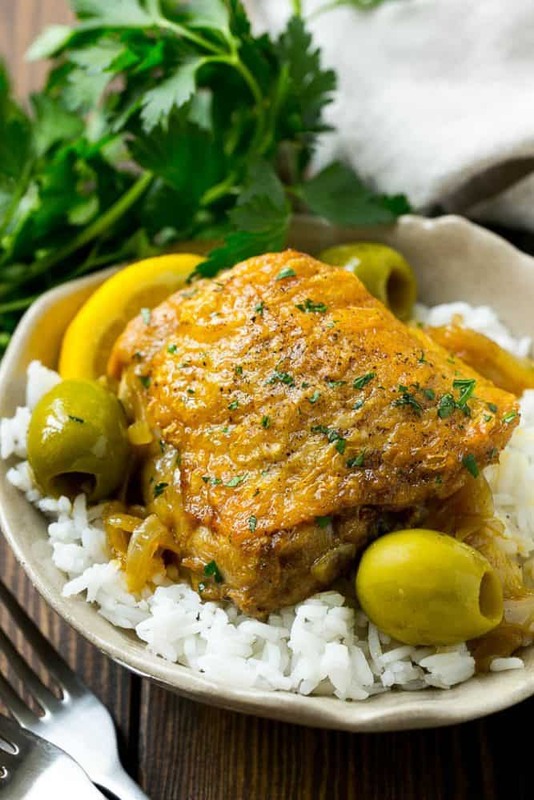 This Moroccan chicken is tender chicken thighs cooked in an aromatic sauce with olives and lemon. An easy dinner that's full of unique flavors! Heat the olive oil in a large oven safe pan over medium high heat. Season the chicken on both sides with salt and pepper and add the chicken in one layer to the pan. Cook for 5-6 minutes per side or until golden brown. Remove the chicken from the pan. Place on a plate and cover with foil to keep warm. Add the onion to the pan and cook for 5-6 minutes or until just softened. Add the chicken broth, paprika, cumin, cinnamon, ginger and turmeric to the pan. Stir to combine. Add the chicken back to the pan. Spoon the liquid over the chicken and place the pan uncovered into the oven. Bake for 25-30 minutes or until chicken is done. Stir in the olives and lemon juice. Sprinkle with parsley and serve, garnished with lemon wedges if desired. really nice change for me, great flavors for chicken and using chicken thighs> Even better, thank you for this recipe! This looks great. Have you tried using these seasonings and making it on your stove top instead, as a one pan meal? I’m going to try it after the one-pan chili lime chicken and rice. I think you are confused. This recipe is a one-pot meal. Use your oven safe pan to sear the chicken on the stove top, then place in oven after onions and seasoning. To kick it up a notch, try using preserved lemons, available at any Middle Eastern grocery as well as some supermarkets.